Lladró has taken its inspiration from the warriors from pre-modern Japan to create a striking sculpture that captures the qualities of these protective guardians: contention and force. Samurai warrior is made in gres, the ideal material for creating large sculptures decorated with enamels. When crystalizing in the kiln, these pigments take on endless subtle nuances that are different in each individual piece, making every sculpture unique and unrepeatable. The piece is completed by the work of the ornamentalist artists in the armor, the helmet and the scabbard, etched entirely by hand. All the Lladro figurines are brand new and in perfect condition. They are made in Spain and come in the original Lladro Boxes. The item is of perfect quality, (we do not sell seconds). We are an authorised Lladro stockist and are one of the largest distributors in the United Kingdom. Please allow upto 14 days for dispatch. All prices are quoted in Pounds sterling. During holiday periods, dispatch will be longer and we will advise you. We reserve the right to make corrections on any item. We will not process any orders where an error has occurred. 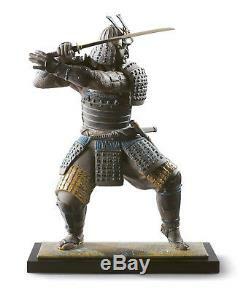 The item "LLADRO Porcelain SAMURAI WARRIOR 01009230 Size 60x44 cm Height 23½" is in sale since Saturday, August 26, 2017.